If you’re new to this blog you’ll quickly learn that I’m a ‘rules are just there to make unadventurous people comfortable’ type of guy. Having said that it never hurts to know what the rules are, and when it comes to suits a few easily-overlooked errors will mark you instantly as a luddite. I won’t bore you with the technological reasons for basting, but this stitch is used during construction in most tailored clothing. In truth there’s no real reason for this stitching to be left in the finished suit at all, other than a mark of bespoke authenticity. 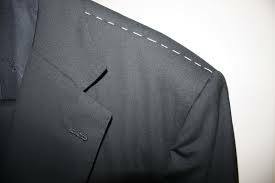 The technology of off-the-peg suits has no need of this method at all, but many manufacturers mimic bespoke suits by introducing these stitches. There are four main places you’ll see this on a new suit, and ALL of it it should be removed if you don’t want to look like a nube! Closing the pocket is part of a very old construction process for bespoke suits, and in off-the-peg suits prevents the pockets from sagging on the rack before you buy it. There’s no real harm in leaving the pockets sewn closed, especially since most off-the-peg suits do this beneath the pocket flap so it’s rarely seen. But the pockets are supposed to be opened, and the stitching is done intentionally to be easily removed. Bespoke suits will have a running stitch along the length of the vent, used as a guide and stabilizer during construction. While off-the-peg suits usually have an ‘X’ tacked at the bottom of the vent. Again this stitching is intentionally easy to remove, and you should do so unless you want to signal your lack of tact. No this is not a trend! It’s a securing stitch used to ensure various layers of structure don’t shift during construction. So if your suit is using fusing or attaching the chest piece by machine, there’s ABSOLUTELY no reason for this stitch, other than to fool the uninformed. Why these labels are attached in the first place is a bit beyond me. Other than making it easier to spot the brand without looking inside the jacket, there’s absolutely no reason. Leaving this attached signals that you’re buying the label, not the suit, and consequently that you know nothing about suits. Please save yourself the embarrassment. Having said all of this, I realize that I’m more than a slight suit fascist. Really clothes are all about personal expression, and if you think it’s cool then who I am to tell you otherwise. Whenever I start thinking along the lines of ‘well there just ARE time-honored rules to style’ I clearly hear my mother’s voice telling me to ‘Get With It’. I guess what I’m saying is that you’re entitled to make your own rules. Although most will agree leaving the tag on your suit is a real no-no, there’s no real reason to remove it. People like me will eventually have to adapt or go out of business. By now you should be ready to take a good hard look at your suit collection and start judging it’s adequacy in representing the person you are on the inside. If you’ve completely forgotten about how important a good looking suit is jump back to this article on the Suit Silhouette.